The beak of the watering can contains lead in the paint. 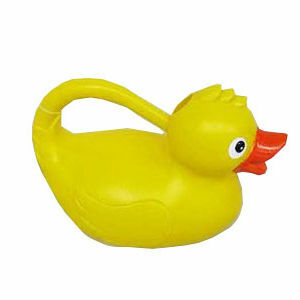 The recalled Robbie Ducky Kids Watering Can is yellow with an orange beak and is about 10 inches high by 6 inches wide. "Robbie Ducky Garden Collection Duck Watering Can" is printed on a sticker on the bottom of the watering can. Jo-Ann Fabric and Craft Stores nationwide from February 2007 through August 2007 for about $10. Immediately take the watering can away from children and return it to any Jo-Ann Fabric and Craft Store for a full refund. For additional information, contact Jo-Ann Stores Inc. toll-free at (888) 739-4120 ext. 7 between 8 a.m. and 5 p.m. ET Monday through Friday, or e-mail guest.services@jo-annstores.com or visit their Web site at www.joann.com.